Astronomers have spotted NGC 6872, the largest known spiral galaxy, by accident. A team was looking through data from the Galaxy Evolution Explorer (Galex) satellite for star-forming regions around a galaxy called NGC 6872. But they were shocked to see a vast swathe of ultraviolet light from young stars, indicating that the galaxy is actually big enough to accommodate five of our Milky Way galaxies within it. The find was reported at the 221st American Astronomical Society meeting in the US. NGC 6872, a galaxy about 212 million light-years away in the constellation Pavo, was already known to be among the largest spiral galaxies. Near it sits a lens-shaped or lenticular galaxy called IC 4970, which appears to have crashed through the spiral in recent astronomical times. Rafael Eufrasio of the Catholic University of America and NASA’s Goddard Space Flight Center and colleagues from the University of Sao Paulo in Brazil and the European Southern Observatory in Chile were interested in a number of regions away from the galaxy. “I was not looking for the largest spiral – it just came as a gift,” said Rafael Eufrasio. Galex – a space telescope designed to search for the ultraviolet light that newly born stars put out – hinted that NGC 6872 was made much larger in size by the collision. The team went on to use data from a range of other telescopes including the Very Large Telescope, the Two Micron All-Sky Survey and the Spitzer space telescope – each of which sees in a particular set of colors, in turn evidencing stars of varying ages. They found the youngest stars in the outer reaches of the galaxy’s enormous spiral arms, getting progressively older toward the centre. That suggests a wave of star formation that travelled down the arms, set off by the collision with IC 4970, with the newest stellar neighborhoods pushing the galaxy into the top spot in terms of size. “It’s been known to be among the largest for two decades, but it’s much larger than we thought,” explained Rafael Eufrasio. 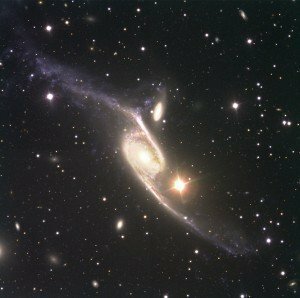 Besides being one for the record books, NGC 6872 updates the catalogue of known galaxy smash-ups, demonstrating how dramatically galaxies can be changed and added to by collisions. “It shows the evolution of galaxies in the larger context of the Universe – how the large galaxies we had before were accreted from small clumps in the early Universe,” Rafael Eufrasio said.